In the fourth grade, the “popular” girls all wore these Airwalk sneakers. I, on the other hand, had dopey white Keds. Trying to fit in, I begged my mom for the Airwalks. When I went to school with my new shoes, a girl said, “You finally got the shoes. Welcome to the cool kids club.” That day I was invited to sit with them at lunch, usually a dreaded time, but I finally had people to sit with—a first for me. This was my first experience actively changing something about myself just to fit in. The years since have been a constant back and forth between retreating into my pain, or bending to fit the mold of what I thought was expected of me. I finally realized that the covering up, the shame, the hiding, it was all feeding my depression. My brain would tell me that I had nothing valuable to say, or that in order to be well received, I had to put on a mask because nobody was really interested in the human being underneath. It’s like being stuck in a game of hide and seek, wondering why no one has found you yet—but maybe I was hiding so well that nobody could find me. I thought I yearned to be seen, but if I was afraid to even look at my own reflection in the mirror, how could I expect anyone to find me? When my depression took a nosedive and I was in and out of treatment programs, I learned to say what I knew would get me discharged. I felt so much guilt about the devastation my illness caused my family, that I wanted to get better just for them. When I did get discharged from various programs, they were proud. Perhaps for a moment, they took a sigh of relief that the storm was coming to an end. Little did they know, I had a monsoon raging on inside. I kept ending up back in the same position: Sad. Alone. Hopeless. Angry. I was so mad at the world for not understanding me. Everyone wanted to fix me, but the more they tried to fix me, the more broken I felt. Underneath all of those walls I had spent years building up, I was still the scared and lonely three year old on the playground, only now the pain had decades to grow and the loneliness was deafening. My relationships, my job, everything in my life fell victim to my depression, my inability to see value in what I had to offer the world. I wanted to disappear, but that’s what I’d been doing for years and it hadn’t gotten me anywhere. The worse my depression got, the more I fell into cycles of self-hatred, worthlessness and suicidal ideations. I didn’t know what it was like to want to be alive. After everything that didn’t work, it was time to get real. Time to peel off the layers, to raise my voice and finally get brutally honest about what I was feeling. With the removal of each layer, I felt more naked and exposed. I wanted my security blankets back. There was no way anyone was ready for the real me, I wasn’t even sure if I was ready. But it was time to live for myself, not for what I thought the world wanted me to be. It was foreign to open myself up to the idea that the person I’d been wishing into non-existence was actually a whole, valuable person who deserved to be alive. The small candle that was flickering deep in my heart was growing and expanding into the light I had been searching for; I could finally see my way. This wasn’t the end of my road; it was just the beginning of my rising. Now, the healing could begin. There’s nothing easy about learning your true self. It is full of discomfort, shame, pain, and guilt—all of the feelings I had spent 30 years running from. I’d throw on a smile, hoping nobody could see the tears building up behind my eyes. I never realized that if I stopped running from my pain, or took down my walls that I would find joy in living my truth. 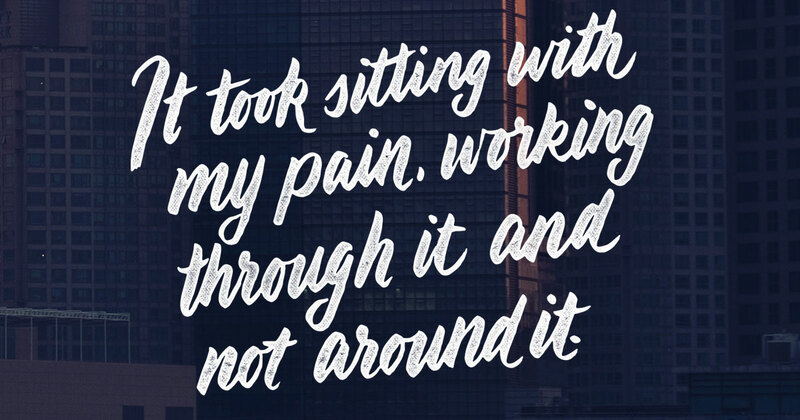 It took sitting with my pain, working through it and not around, but now my path is no longer about fitting in, or being accepted or even comfortable. It’s about leaning into the discomfort and learning to accept myself without worrying if I’m too much or not enough for some people. I may be flawed, but I am not broken. And each day I can remind myself of that, I’ll be moving closer to the beautiful life that has been patiently waiting for me. Your words have helped to shed light on what I’ve been struggling with a lot lately. Thank you, and all the love to you as you go through your journey. Wow, this hit so close to home, under the tears of relief, finally we are seeing who we are, after 40 years for me of uncovering the layers. As scary as each lifting of the veil is, I can breathe just a little freer to finally find the me I am so delighted to be, beautifully flawed and transforming all those scars into treasures only I know their rarest of values. To be free of the labels and the lies we believed and were fed, to know peace without another’s validation. That is the blessing and source of my newfound love, myself. I’m preparing to enter dual diagnosis intensive outpatient or a different intensive outpatient just for mental health. For the past four months my cravings to cause self-harm have brought me to want to end my life. I have been inpatient twice in this time period. It all lurks back to when I was 12 or 13 and sewing thread through my skin in curiosity and depression. I have done a lot of growing since then. Today I’m drug free, and I no longer gamble. I haven’t intentionally cut myself since I was 25 but just this morning I was banging my head into the wall a bit abruptly. I scare myself when I do that. I was caught and I know she knew, but she knows me very well from years of psychiatric rehabilitation. I’m still in that psychiatric rehabilitation as we speak. My job hunt is my biggest stressor these days. Sleep is my most difficult living skill to master. I go for a sleep study next month or the month after. They think I have sleep apnea. I may be flawed. My hands may be small in how much I can really control. BUT I am NEVER broken! We’re so sorry to hear that you’re struggling right now. We know this life has it’s challenges and hard days, sometimes you might feel like your urge to self-harm is bigger than you, this but it’s not. Matt, you’re loved and were made to be loved. We’re so proud of you for how far you’ve already come and we have so much hope for you and all you’ll do in the future. Remember that it is okay to have hard days, and even on the hardest days there is still hope for healing and recovery. If you’d like some encouragement from our team, please email us at info@twloha.com. We’d love to send some your way. Our team is rooting for you! Amazing! Well said. I have found myself at that proverbial fork in the road also. I am finally embracing who I am after years of my husband making comments that I was drawing attention to him and/or embarrassing him. Ironic thing is, he left me for a woman who is the way I was when he and I met. He spent years changing me to leave me for me essentially.